What?! There is an island in the middle of Pairs?! Yes! Three in fact! The Île Saint-Louis is one of two natural islands in the Seine river, in Paris, France (the other natural island is Île de la Cité; the Île aux Cygnes is artificial). This tiny island-village is composed of three east-west streets and seven north-south streets. An 18th century church bell tower watchers over the main street, rue Saint Louis en L’ile. Ile Saint Louis is connected to the rest of Paris by bridges to both banks of the river and by the Pont Saint-Louis to the Île de la Cité (where the famous Cathedral of Notre Dame resides). 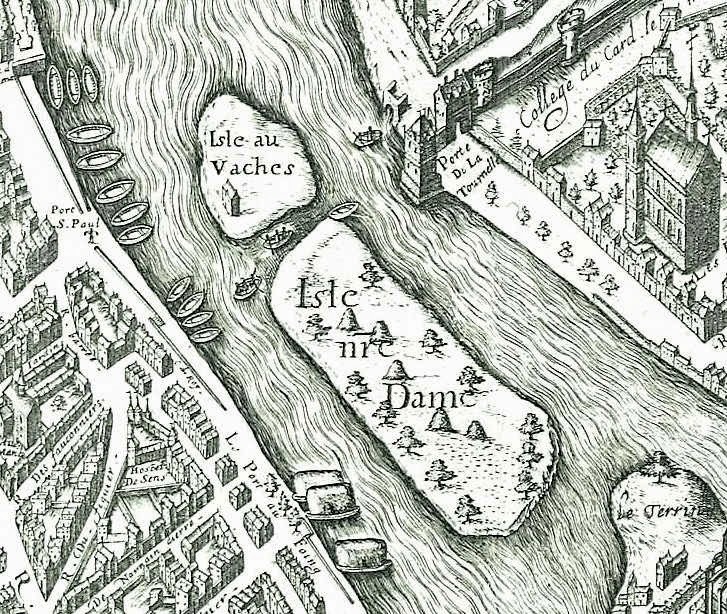 During the middle ages, Ile Saint Louis was originally two islets, in the east l'île aux Vaches (Cow Island, a former grazing pasture) and L'île Notre-Dame in the west, both which belonged to the monks of the chapter of Notre-dame. In the seventeenth century, Louis XIIIth decided to create a residential district, joining the two islets. The works began in 1614, when a group of financiers, Marie, Poulletier and Le Regrattier, who lent their names to some streets of the isle, began developing the island. Baroque architect Louis Le Vau, one of the most prestigious architects of his time (who later worked on Versailles) designed fabulous private homes for aristocrats, including the majestic mansions Hôtel Lambert with interior decoration by painter Charles Le Brun and the Hôtel de Lauzun where later writer Théophile Gautier founded the Club des Haschischins (hashish smokers club which drew the likes of Baudelaire, Delacoix and Balzac who gathered around an opium pipe and exchanged ideas) on the lovely quai d'Anjou. In 1725 it was named "île Saint Louis" after the king Louis IX (1226 to 1270), but during the French Revolution it temporarily took the name of "île de la Fraternité" (isle of Brotherhood). One of France's first examples of urban planning, it was mapped and built from end to end during the 17th-century reigns of Henri IV and Louis XIII and its buildings are romantically frozen in time allowing one to imagine what the island may have been like centuries ago. Since then many of the Parisian aristocracy moved in to enjoy the pleasures of the island. 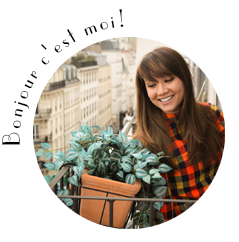 Numerous celebrities have lived there (Camille Claudel, Léon Blum, Georges Pompidou, Georges Moustaki, Ernest Hemmingway etc.). A peaceful oasis of calm in the busy Paris center, this island has only narrow one-way cobble stone streets, no métro stations and two bus stops. The island has a small village feel and it’s hard to imagine you are in the heart of a pulsating cosmopolitan city. Most of the island is residential, dotted with markets, bakeries, fromageries, restaurants, shops, cafés and ice cream parlors (the most famous one, the beloved-half-century old ice cream parlor Berthillon). Also on the island is beautiful church, called Saint-Louis-en-l'Île Church, dedicated to Saint Louis with its foundations dating back to 1623. Île Saint-Louis is easily accessible from many areas in central Paris. 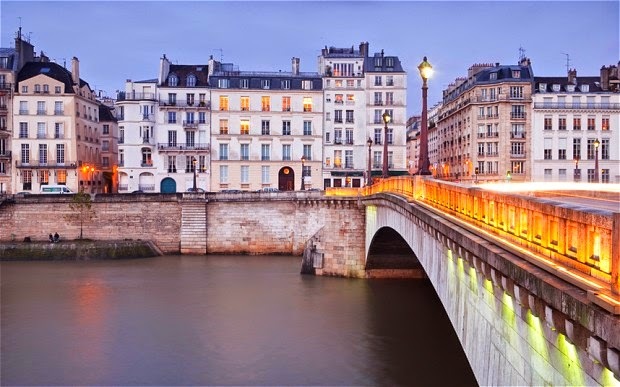 The closest metro stops are Pont Marie and Sully-Morland (from there you just cross the bridge). From Ile de la Cité, walk left of Notre Dame Cathedral’s facade and then head to the back side of the church. 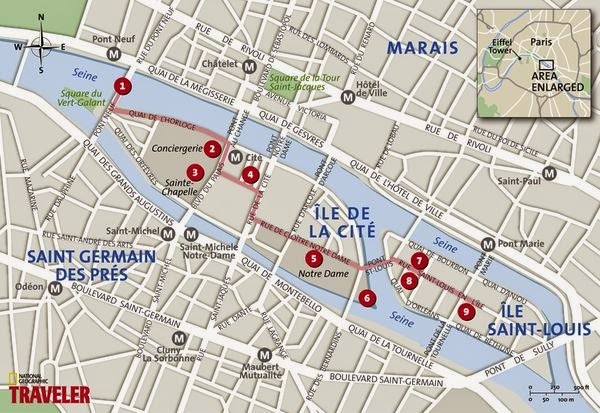 Follow the road to the bridge and then cross to Île Saint-Louis!